Colombian President Juan Manuel Santos will meet with President Donald Trump on Thursday, visiting a White House hamstrung by a chaotic week, just one day before the Mr. Trump embarks on his first foreign trip abroad. The two world leaders, who have spoken twice by phone, will meet in person for the first time in order to establish a closer relationship with the U.S.'s most important partner in counter-narcotics efforts. 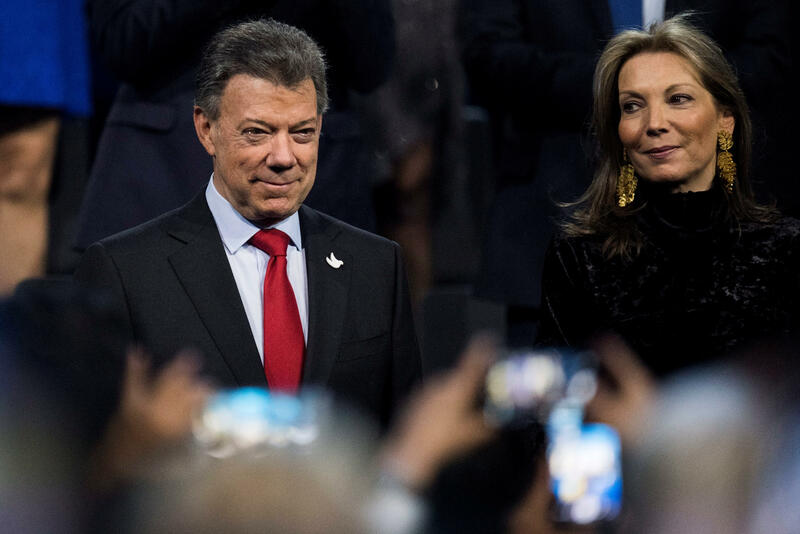 Mr. Trump, who met with two former Colombian presidents and opponents of Santos and the peace accord last month, is expected to publicly support the deal alongside the current Colombian President during the course of their meetings. But U.S. financial support for the effort is still in question. In an interview with El Tiempo on Monday, Department of Homeland Security Secretary John Kelly said that the administration views "the peace process with hope and understands that it is not only good for Colombians but for the region and the United States." "I don't want to oversimplify the budget, but in policy, love is expressed through the budget," Mr. Pinzon said. A budgetary commitment from the White House to renewing the multimillion-dollar package, however, remains in doubt. "I wouldn't expect the president to commit to anything," a White House official told CBS News. Pure cocaine production has also surged, increasing by 37 percent. Eventually, this cocaine is trafficked to the U.S. — the world's biggest market. The demobilization of FARC, which extracted itself from the billion-dollar cocaine business as part of the terms of the Peace Accord, has led to other criminal groups vying for a stake in the cocaine business where FARC has withdrawn. Two outspoken critics of the peace deal, former Colombian Presidents Álvaro Uribe and Andrés Pastrana Arango, met with Mr. Trump at Mar-a-Lago in April. The meeting was not revealed to reporters at the time. Mr. Pinzon dismissed the suggestion that the former presidents had influence with the Trump administration. "It's natural when the President of the U.S. crosses in his path two former Presidents – good to have a conversation," he said. "I think higher is impossible in terms of seeing the people that influence the policy. And second, I think support in Congress speaks better than any other opposing idea." President Santos, who arrived in D.C. on Wednesday, is prepared to make the case for continued financial aid of what Pinzon called "the most important strategic partner in the Western Hemisphere." In describing conversations with skeptical members of Congress, Pinzon has argued that the rise in cocaine is precisely why the U.S. cannot pull back support from Colombia now. "The only people that will benefit are our drug traffickers and criminals," he said. The timing of Mr. Santos' visit caps a tumultuous week for the Trump administration, which has been reeling from damaging reports that the President pressured former FBI Director James Comey to end an investigation into his former National Security Advisor General Mike Flynn. "Living in the U.S. gives you a lot of calm these days, you know, because then you go to Colombia and you say, well this is a little bit of the same I been seeing out there," Pinzon said.